Biotinylated Human CD52, Fc Tag (CD2-H82F3) is expressed from human 293 cells (HEK293). It contains AA Gly 25 - Ser 36 (Accession # P31358-1 ). The protein has a calculated MW of 29.7 kDa. As a result of glycosylation, the protein migrates as 38-45 kDa under reducing (R) condition, and 66-100 kDa under non-reducing (NR) condition (SDS-PAGE). 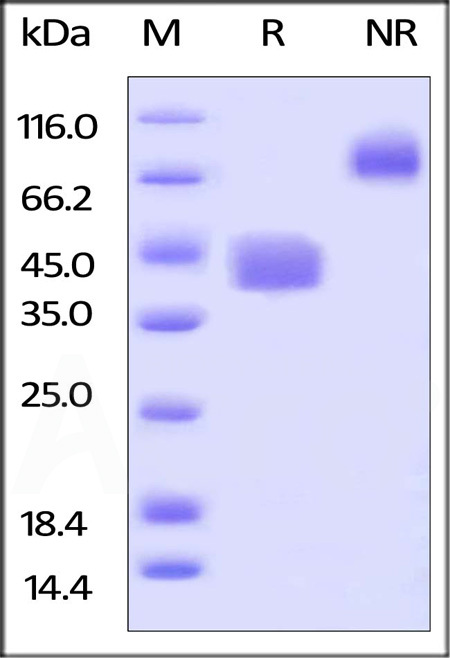 Biotinylated Human CD52, Fc Tag on SDS-PAGE under reducing (R) and non-reducing (NR) conditions. The gel was stained overnight with Coomassie Blue. The purity of the protein is greater than 95%. 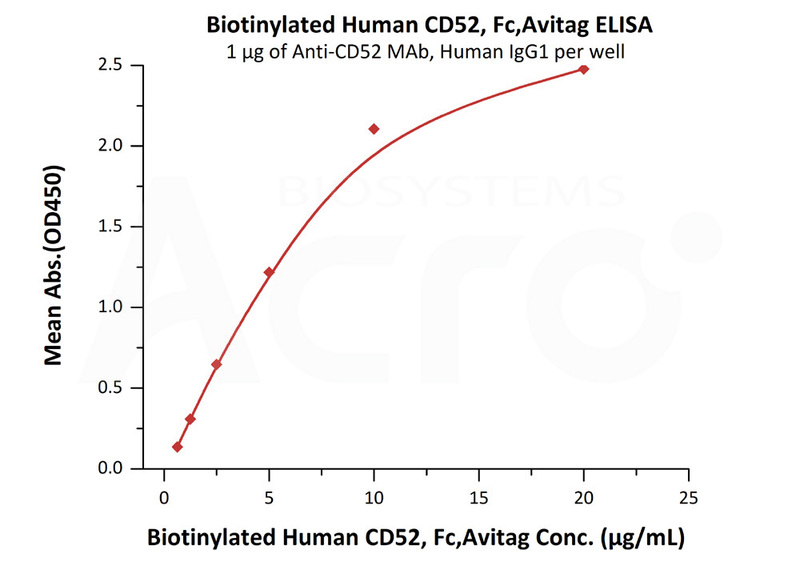 Immobilized Anti CD52 MAb, Human IgG1 at 10 μg/mL (100 μL/well) can bind Biotinylated Human CD52, Fc Tag (Cat. No. CD2-H82F3) with a linear range of 0.625-10 μg/mL (QC tested). CAMPATH-1 antigen, also known as cluster of differentiation 52 (CD52), is a glycoprotein that in humans is encoded by the CD52 gene.It is widely expressed on the cell surface of immune cells, such as mature lymphocytes, natural killer cells (NK), eosinophils, neutrophils, monocytes/macrophages, and dendritic cells (DCs).ligation of cell surface CD52 molecules may offer costimulatory signals for T-cell activation and proliferation. (1) Zhao Y., et al., 2017 ,Immunogenetics. (2) Hersh C., et al., 2014, Immunotherapy. 6(3):249-59.